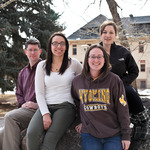 The Spatial Psychology research team at the University of Wyoming was formed to pursue research questions related to how psychological constructs are represented in and affected by their geographic space. Members include graduate students and faculty members in Psychology and Law and Social Psychology sub-disciplines. Eric, thank you so much for supporting our research. We are committed to this study, and will continue applying for grants and using crowdfunding to ensure we are able to examine these very important issues. I really like your idea about looking at the relationship between our data and educational attainment. We will certainly add that to the list of future studies. We'd appreciate it if you would share your enthusiasm and interest with your friends on social media. The more people who know about are project, the more likely it will be that we reach our goals. Safe travels! Thank you for contributing and caring about this research Shalana! Thank you, Stephannie! You're the best! Thank you, Stephanie! You're the best! Cindy, the best way is to share a link to this page with your friends via social media or e-mail. We think if we can get people talking about this project, they'll be more likely to contribute to it's success!